Life Savers—those sweet, unmistakable rolls of hard candies with the hole in the center—have been a quintessential American candy since the early 1900s. 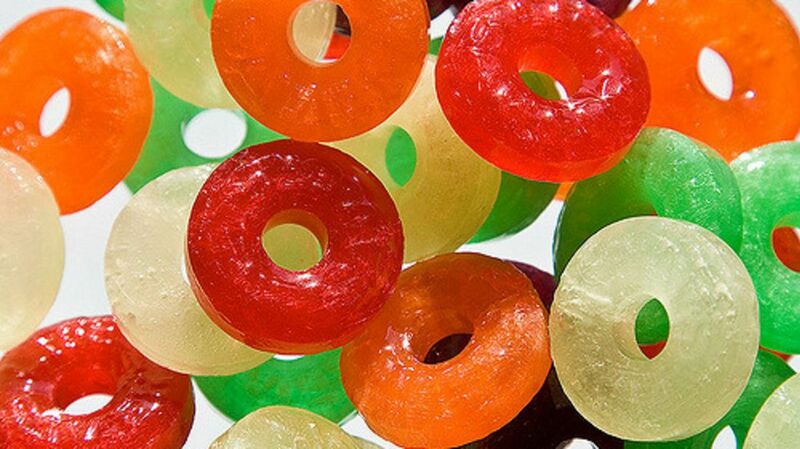 And after more than 100 years, Life Savers remains one of the leading candy brands in America. 1. ITS CREATOR BEGAN WITH A MAPLE SUGAR BUSINESS BEFORE MOVING INTO CHOCOLATES AND CANDY. Clarence Crane was the son of a maple sugar producer in Cleveland, Ohio. He worked with his father until 1903, when he struck out with his own maple sugar business, which became one of the largest producers of maple sugar in the world. In 1909 Crane sold the maple sugar business but continued to work for the company as a salesman. Two years later, he opened the Queen Victoria Chocolate Company and began to produce chocolates. 2. LIFE SAVERS WERE INSPIRED BY A VISIT TO THE PHARMACIST. Crane soon realized that his chocolate sales suffered during the summer months because the chocolates would melt quickly in the heat. In 1912 he began experimenting with various hard candy formulas. During a trip to buy flavoring extracts at the pharmacy, he noticed their pill making machine. It produced round, flat pills, and Crane determined this machine could be used to create flat, round, summertime peppermints—a novel idea at the time since most mints were square-shaped and imported. 3. THAT HOLE IN THE CENTER ISN'T GOING TO SAVE YOUR LIFE. There is an urban legend that Crane’s child tragically died by choking on a mint, and that this tragedy forced him to create the hole in the center so that if the candy was lodged in your throat, you could still breathe. Hence, the name Life Savers! This tale is far from true—Crane actually wanted to differentiate his mints from the popular European mints of the time, and the name was inspired by the candy resembling the life preservers used on boats. As for Crane's child, his only son, the poet Hart Crane, did unfortunately die at sea in 1932. On a voyage to New York, he jumped overboard in the Gulf of Mexico and his body was never recovered. 4. CRANE PLAYED UP THE NAUTICAL IMAGERY FOR HIS ORIGINAL LIFE SAVERS. Originally, Life Savers only came in peppermint flavor, and were marketed as Pep-O-Mint Life Savers. Crane came up with the slogan "For that stormy breath" to sell his new breath mints. 5. JUST ONE YEAR AFTER CREATING LIFE SAVERS, CRANE SOLD THE RIGHTS. On an whim, businessman Edward J. Noble bought a roll of Life Savers and quickly approached Crane with ideas on expanding sales with new advertising schemes. Crane wasn’t interested, and instead he decided to sell the rights to Life Savers to Noble for $2900 in 1913. In the span of 12 years, Noble and business partner J. Roy Allen turned their investment into a $1.5 million corporation. One thing that helped? Noble replaced Crane's impractical cardboard packaging with a thinner tin (and later aluminum) foil roll that also kept the candies dry. 6. "STILL ONLY 5 CENTS" BECAME A KEY SLOGAN FOR LIFE SAVERS. Noble made a number of innovative marketing moves in order to expand sales, including having his clients strategically place Life Savers next to the registers of restaurants, saloons, and grocery stores, and training his clients to always provide a nickel when giving change. With the rolls of breath mints sitting right there boasting that they were only 5 cents, and a newly received nickel in the hands of the customer, the candy practically sold itself. The low price-point continued as a selling point for decades as Life Savers started advertising their candies as "Still Only 5 Cents!" 7. DURING WWII, LIFE SAVERS REMINDED THE TROOPS OF HOME. The Armed Forces packed some 23 million boxes' worth of Life Savers into soldiers’ ration kits as a sweet taste of home. To keep the mints in high production during this period, other candy manufacturers donated their sugar rations to the company. 8. THE FIVE-FLAVOR ROLL HAS ONLY HAD MINIMAL CHANGES OVER THE YEARS. The original fruity flavors—lemon, lime, orange, cherry, and pineapple—were introduced in 1935 and remained untouched for almost 70 years. In 2003, Life Savers altered their five-flavor roll by replacing lemon and lime with raspberry and watermelon. Life Savers had also swapped out orange for blackberry, but the change was short-lived. More than two million people had voted for the flavor swaps in an online poll, but poor blackberry turned out to be an unwanted addition. Orange was quickly added back to the lineup. 9. BLACKBERRY WASN'T THE ONLY FLAVOR TO FLOP. Life Savers has introduced quite a number of flavors, minty and otherwise, over the years, from Cl-O-ve and Cinn-O-mon to the ever-popular Butter Rum. But in 1920, Life Savers rolled out Malt-O-Milk, which defeats the purpose of having a candy that either freshens your breath or provides a fruity pick-me-up. The flavor was discontinued within a couple of years. 10. LIFE SAVERS SOLD AS PART OF A NEARLY $1.5 BILLION DEAL IN 2004. As part of a package with Altoids, Kraft Foods sold Life Savers to the Wm. Wrigley Jr. Company for nearly $1.5 billion. Not bad for little mint company that was originally purchased for less than $3000.